The 3rd Annual Wings of Hope, A Butterfly Release, Cancer Support Community Delaware, Fundraising Event, Delaware Beaches, Sussex County, Southern Delaware…A Community Wide Celebration!! Impacted by cancer…too many friends and family members afflicted. The Cancer Support Community Delaware’s mission is to ensure that all people impacted by cancer are empowered by knowledge, strengthened by action, and sustained by community. They are the only organization in Delaware dedicated exclusively to helping people cope with and manage the emotional aspect of cancer. All of their programs are free of charge. 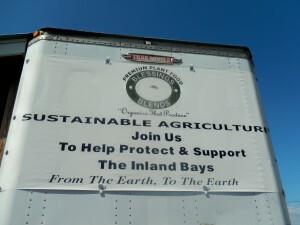 And, all funds raised in Sussex County stay in Sussex County. The 3rd Annual Wings of Hope…A Butterfly Release to benefit Cancer Support Community Delaware will be Saturday, 9/14/13. Rain date will be Sunday, 9/15. Location? The Medical Arts Building, 18947 John J. Williams Highway in Rehoboth Beach, Delaware. Time? 10 a.m. until 1 p.m. It will be a fun event and FREE!! Everyone is welcome. There will be activities, entertainment, vendors, and refreshments. Seeded butterfly cutouts ($10) will be available for purchase, as well as the opportunity to release your own live butterfly ($30 in advance, $40 at the event). The highlight of this fundraising event will be the butterfly garden created by Sposato Landscape and the release of 250 live Monarch butterflies. More info? Please visit http://www.cancersupportdelaware.org/wingsofhope. You are encourage to purchase $10 seeded butterfly cutouts to honor those who have been touched by cancer. These will be displayed at the Wings of Hope Butterfly Release. In addition, and with the spirit of the butterflies, you can purchase $1 paper butterflies at Brafman Family Dentistry, All Grotto Pizza, Hocker’s and Super G foods stores in Sussex County. In early spring, Blessings Blend is one of the first to have flowers out on Rt. 1, South of Milford. 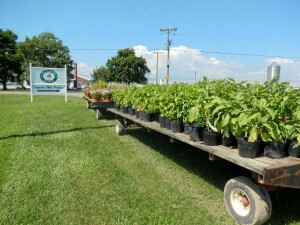 The actual location of Blessings Greenhouses and Compost Facility Retail Center is the corner of Rt. 1 (north) and Sugar Hill Rd. 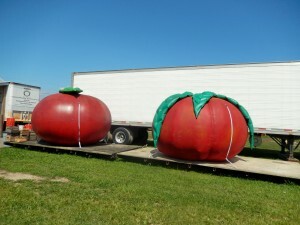 Driving to or from the Delaware Beaches you might have seen these 2 giant tomatoes. That’s the location!! 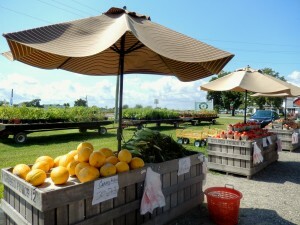 I decided to stop and get some peaches and tomatoes. To tell you the truth, tomatoes this year have not been the greatest, in my opinion. 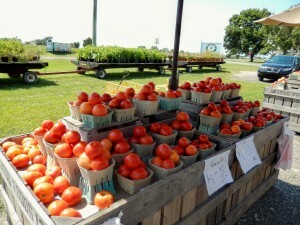 These tomatoes ended up having a pretty good taste. I can’t believe it took almost all summer to find them. 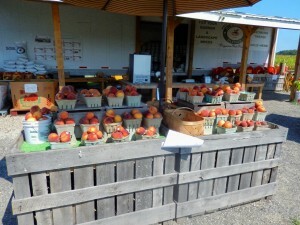 The peaches were sweet and juicy. 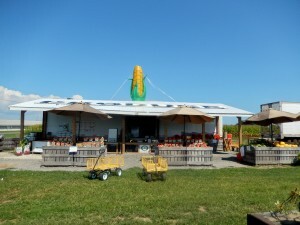 They told me all their produce is locally grown. You learn something new every day and I found out that the owner of Blessings Blends, Bruce Blessing…I have not met him, developed a premium compost that is being used on golf courses and farms on the Delmarva Peninsula. For the second year in a row he has been selling it bagged and bucketed at his flower and produce stand located on Rt. 1. It has taken him 6 years to develop it. I really don’t anything about “composting”, but, learned that this Premium Compost has received an OMRI (Organics Material Review Institute) Listing .5-.5-.4. 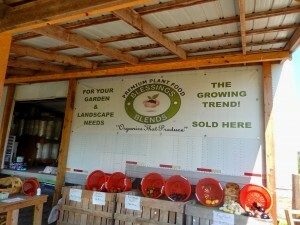 There are hundreds of organic farmers in the Chesapeake and Delaware watersheds and Blessings Blends will be targeting them, since they have gotten the OMRI Listed Premium Compost. Want to know more? Please call Blessings Blends at 302-684-8990 or visit http://www.blessingblends.com. 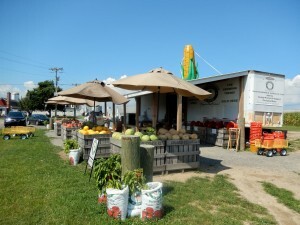 In the meantime, safe travels as you leave Summer of 2013, and begin the Second Season at the Delaware Beaches…this produce stand is open!! 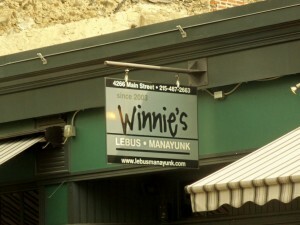 Winnie’s, Restaurant, Bar, Breakfast, Lunch, Brunch, Dinner, Manayunk, Philadelphia, PA, Good Gotta Eat Food!! 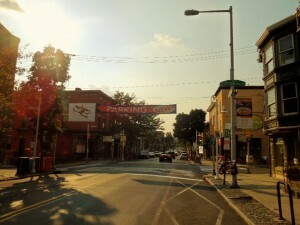 Manayunk is a neighborhood of Philadelphia. With its small town charm, boutiques, specialty shops, and plenty of restaurants, it sorts of reminds me of a town with similar attitude in Florida…Delray Beach. Minus the palm trees, though. 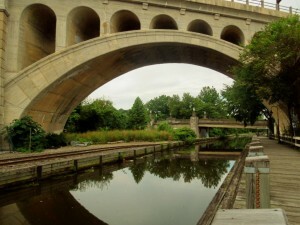 Manayunk has the Towpath, which is accessible from Fairmount Park to the east and from the Schuylkill River Trail to the west. Lots of joggers, cycling, and walkers on this tranquil and beautiful path. Overlooking Main Street, sitting above it, the town is hilly, is Pretzel Park. I could not find out why it has that named but it has been mentioned that it could be because of the pretzel shape of the sidewalks or because for many years a pretzel vendor was selling Philly pretzels. 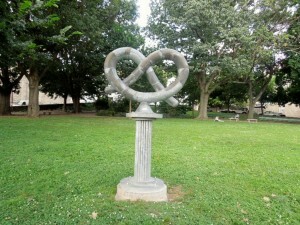 A dog park, benches, playground and on Saturdays the Farmers’ Market makes Pretzel Park its home. 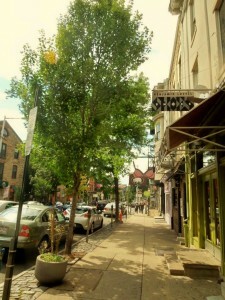 During the day the streets are quiet in Manayunk but come happy hour there is a different scene. Most restaurants have dining al fresco. On week-ends tables at sidewalks are filled with patrons ready to taste great food for every discriminating palate. 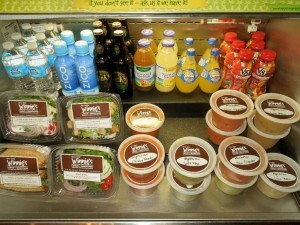 Our choice was Winnie’s, located at 4266 Main St. Tel. 215-487-2663. Website? 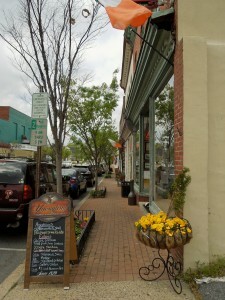 http://www.lebusmanayunk.com. It opens for breakfast, lunch, brunch (Saturday and Sunday), and dinner. 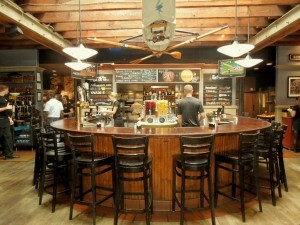 Taking center stage at Winni’es is its bar. Then, dining on both sides of the restaurants and outdoors, as well. 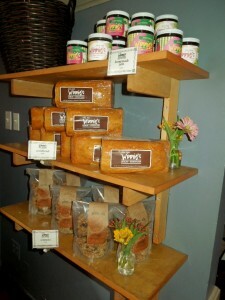 Healthy comfort food..their baked goods are so delicious. Don’t push that bread basket away. Their corn bread is very good. They also sell it at the restaurant. 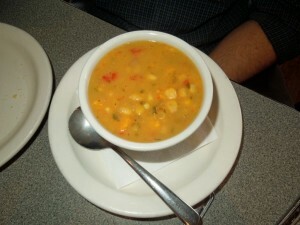 Soups are made daily at Winnie’s and on that particular day their sweet potato corn chowder was full of flavor and very tasty. 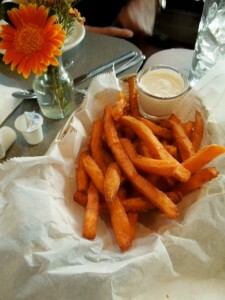 An order of sweet potato fries accompanied with a dipping sauce of sour cream, horseradish, and I believe honey. It had some sweetness to it. We ordered the fries without salt. I love fries that are crispy and these ones were perfect. The Crisp Pear Salad – Mixed greens tossed in citrus vinaigrette with bosc pears, crumbled blue cheese, roasted peppers ad spiced walnuts. 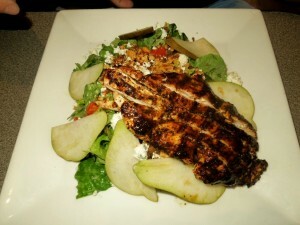 This salad was topped with their Colorado Chicken, which is the best. It is grilled with ancho chili. 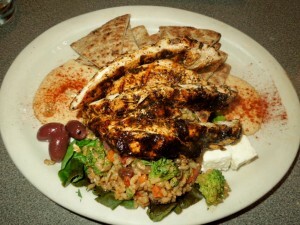 A Healthy Brown Rice Nut Salad had brown rice, broccoli, carrots, peppers, onions, sunflower seeds, almonds, raisins and walnuts, tossed in tahini dressing and served with feta cheese, hummus, roasted peppers, calamata olives and pita. Topped also with the Colorado Chicken, it made a heck of a lunch!! 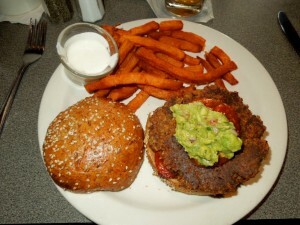 The Veggie Burger – Whole grains, vegetable spices and herbs, grilled and topped with guacamole and salsa on a wheat bun with those delicious sweet potato fries. Very good!! 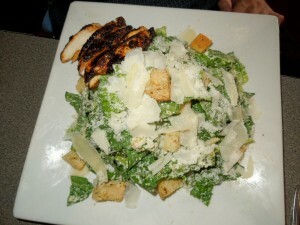 The traditional Caesar Salad was also ordered and again, the Colorado Chicken was ordered to accompanied the salad. No dessert was necessary….I think we ate enough!! On the run? Want something to go? In a corner of the restaurant there is take out. 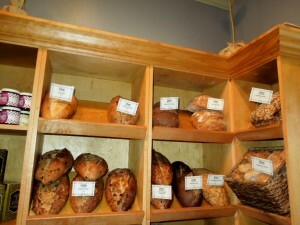 And, freshly baked breads. The StrEAT Food Festival kicks off on September 21st from 11 a.m. until 5 p.m. Main Street will be lined up with some of Philadelphia’s best food trucks with specialties from ice cream to Asian delicacies. Plenty of options at affordable prices. 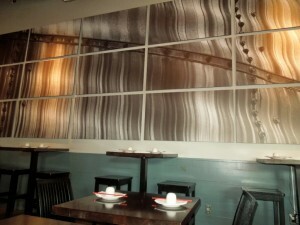 The restaurant week will be ongoing until October 5th. 22 restaurants are participating with special 3 course menus offered at $10, $20, and $30 price ranges. More info? 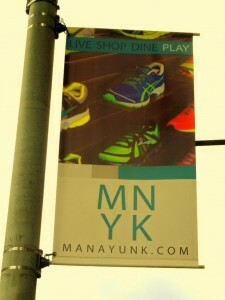 Please visit http://www.manayunk.com/signature-events/streat-food-festival-restaurant-week/fall-streat-food-festival. Have a great day!! 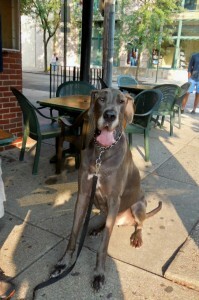 This pooch was enjoying one beautiful day in Manayunk!! 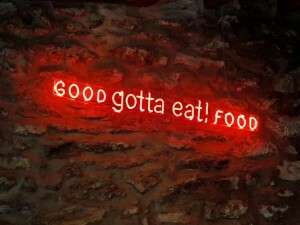 Comments Off on Winnie’s, Restaurant, Bar, Breakfast, Lunch, Brunch, Dinner, Manayunk, Philadelphia, PA, Good Gotta Eat Food!! 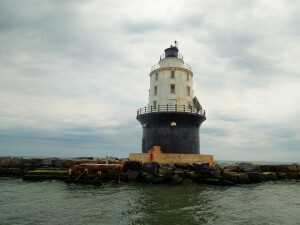 One of my highlights this summer was the tour by the Delaware River & Bay Lighthouse Foundation. Get up close to these lighthouses and you can expect to be so humble. They are gorgeous and with only a few tours left for the Summer of 2013, it is worth mentioning that this is what’s going on. Saturday, August 24th at 2 p.m. and Saturday, September 7th are the tours left. 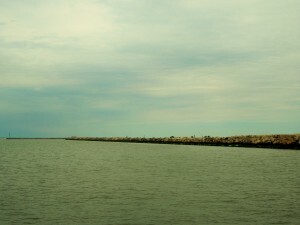 These tours take off from the pier behind the Cape May Lewes Ferry Terminal. If you would like to go on it today, please call 302-644-7046. Website? 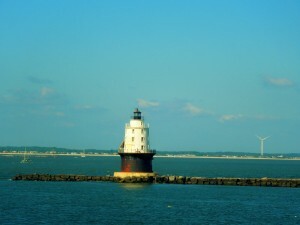 http://www.delawarebaylights.org. It might be a little late, but try it. Sunday, September 8th – Sunset Tour from 5:30 p.m. until 7:30 p.m. Check in no later than 5:15 p.m. Meet at Anglers Fishing Center on 213 Anglers Rd. 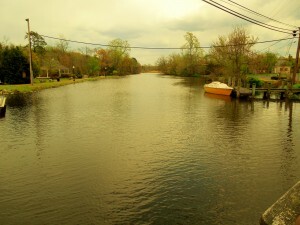 at Anglers Marina in Lewes, Delaware. 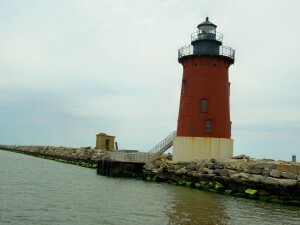 Go to the end of Anglers Rd, approximately 100 yards past Irish Eyes Restaurant in Lewes. To reserve your space please call Red Mouliner at 302-226-3866 (home) or 302-542-4432 (cell), and do that no later than September 1st. 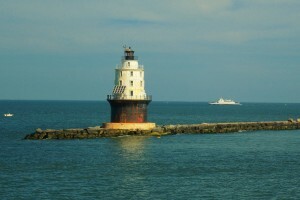 They will be cruising up the canal, out to both Breakwater Light and Harbor of Refuge Lights. You might be able to see dolphings so make sure you are camera ready. This is a BYOB and snacks event. The cost is $30 per person and all profits will go towards the new docking system at Harbor of Refuge. Registration form and payment must be received by September 3rd. You can download the registration at http://www.delawarebaylights.org. 14th Annual Broadkill River Canoe & Kayak Race, Irish Eyes, Pub & Restaurant, Saturday, August 24th, Broadkill River, Milton, Delaware, The Largest Canoe & Kayak Race on the Peninsula! How about button making? Large mother of pearl shells were once shipped to Milton from the South Pacific. The button blanks were cut and polished and then shipped to the northeast for more decoration and use on garments of al kinds. 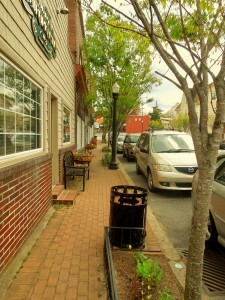 You can find these facts and more on http://www.historicmilton.com. 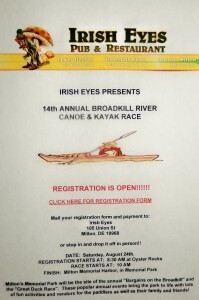 But, on Saturday, August 24th, Irish Eyes Pub & Restaurant, located on 105 Union St. in Milton, will be presenting the 14th Annual Broadkill River Canoe & Kayak Race. Registration is open and it will start at 8:30 at Oyster Rocks. The race will start at 10:00 a.m. It will finish at Milton Memorial Harbor in Memorial Park. At Milton Memorial Park the annual “Bargains on the Broadkill” and the “Great Duck Race”…these popular events will be part of the highlights on this upcoming Saturday. Lots of funs and activities and plenty of vendors, as well. Get your family and friends….it is just up the road from the Delaware Beaches!! Comments Off on 14th Annual Broadkill River Canoe & Kayak Race, Irish Eyes, Pub & Restaurant, Saturday, August 24th, Broadkill River, Milton, Delaware, The Largest Canoe & Kayak Race on the Peninsula! Rehoboth Beach – Thursday, August 22nd – Known for beautiful beaches, award winning boardwalk, great shopping and fantastic dining. From boardwalk grub to fine dining, Rehoboth Beach, the Nation’s Summer Capital, offers dining for every palate. Today, the 1st Annual Taste of Rehoboth will be taking place at the Rehoboth Beach Convention Center, located at 229 Rehoboth Avenue. If you are visiting the Delaware Beaches this might be a good opportunity to sample some of the good food Rehoboth Beach has to offer. Tastings, live music, wine/beer pairings, and cooking demos will be happening from 5 p.m. until 8 p.m. Tickets are $40 in advance or $50 at the door. Azura Clothing – 139 Rehoboth Ave.
Eden – 23 Baltimore Ave.
Jam – Sister restaurant to Eden – next door on Baltimore Ave.
Blue Moon – 35 Baltimore Ave.
Cabo – 210 2nd St.
Hobos – 56 Baltimore Ave.
a(Muse) – 44 Baltimore Ave.
Espuma – 28 Wilmington Ave.
A portion of all proceeds will be donated to the Food Bank of Delaware. We went for a little bit of a more upscale Chinese dining….it is still a very casual place…Han Dynasty is located at 3711 Market St. in Philadephia. The telephone is 215-222-3711. Website? http://www.handynasty.net. 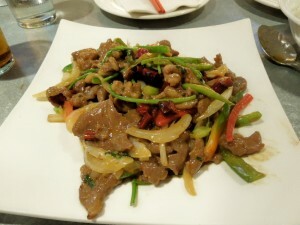 The cuisine at Han Dynasty is known as Sichuan. “Sichuan” , previously known as Szechwan, is a province in the West of the Southern Central Region of China. This restaurant serves food family style. It is perfect for sharing and they do open for lunch and dinner. You can eat at the bar or sit at the tables. It does get crowded. Our server was CJ and he was great with his recommendations. Han Dynasty packs a lot of heat in its dishes. The level of heat for each one is on the menu. But, if you want a little milder or hotter, don’t be afraid to ask because they will be more than happy to oblige. 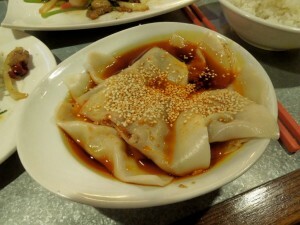 The Dumplings in Chili Oil were spicy and perfect for an appetizer. I thought this particular entree had tofu, but I am not sure if they forgot and gave me an extra order of Stir Fried Lamb in Hoisin and Oyster Sauce. It was good and I did ask for a number 5 in the heat level. 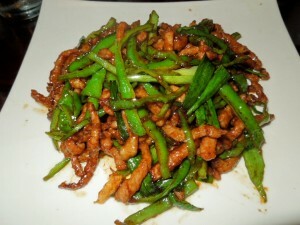 The Pork Long Hot Pepper Style were stir fried and included shredded long hot peppers. Full heat!! 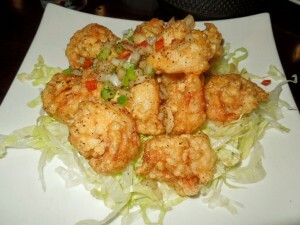 CJ told us that the Salt & Pepper Shrimp were very good. We did try them and they were very light and had just the right amount of salt, pepper, and heat. 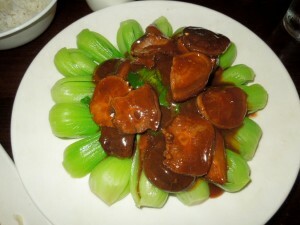 And, I loved this vegetarian dish of Bok Choy with Black Mushrooms!! No dessert was necessary, just a long walk along the streets of University City. Please note that if you do have a gluten diet they will be able to modify some of the dishes. If you are visiting the Delaware Beaches, I am sure you can dig out some casual beach attire in order to attend a worthy cause. 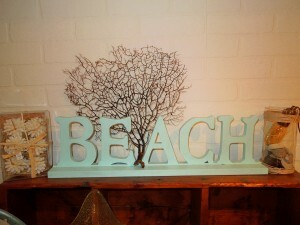 It is at the beach, for the Children’s Beach House, located at 1800 Bay Ave., Lewes, Delaware. 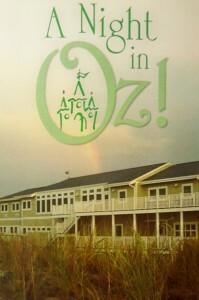 A Night in Oz! is the theme for the 11th Annual Beach Barbecue. It will take place on Saturday, August 24th from 6:30 p.m. to 9:30 p.m. Tickets are $100/person. You can purchase tickets or donate on line, by visiting http://www.cbhinc.org. Or, you may also call 302-645-9184. Catering will be by Nage. Emerald City Auction, A Silent Auction will all be part of the “fun” raising event. The Children’s Beach House was founded in 1936 by Lydia Chichester du Pont, to help children with special needs reach their highest potential as functioning members of their families and communities. The unique approach at the Children’s Beach House focuses upon the strengths of the 7 to 18 year old youth and their families. Each child is assigned a caseworker, who partners with families, schools, health professionals, and community organizations to maximize resources. If you would like to learn more about the Children’s Beach House, its history and mission, please visit the above mentioned website….volunteers are always needed.